Even more action will arrive in the children's room with the Kullerbü wheel loader and dump truck construction site vehicles from HABA. The wheel loader with momentum motor pushes balls in front of it or transports them in its bucket, which has two tipping positions. Building rubble accumulates of course at every construction site. The dump truck can very quickly transport it away. The construction site vehicles will always provide all kinds of playing and driving fun – during free play or in combination with the Kullerbü play tracks. In short: A great gift idea for a child's birthday or simply anytime. Contents: 1 wheel loader, 1 dump truck, 1 building rubble ball. Material: beech, plastic. 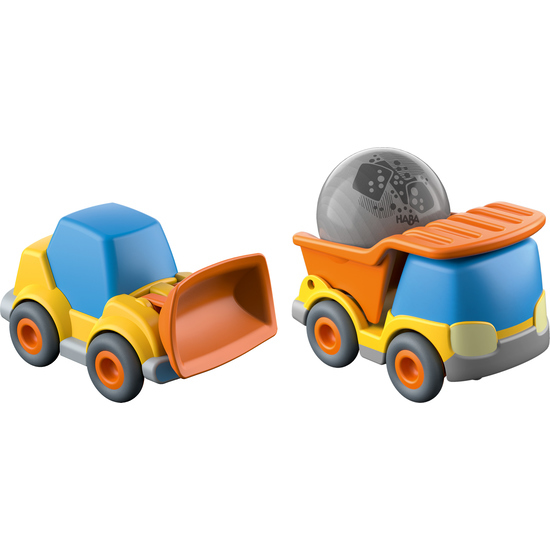 Dimensions: Wheel loader L 9 x W 6 cm, dump truck L 9 x W 5.7 cm, Ø balls 4.6 cm. Age: from 2 years. For anyone who wants to learn more about Kullerbü, there are read-aloud stories, DIY content, information for parents, and games in the Kullerbü theme world.